Spend more time on aircraft and less time on paperwork. Plan and manage your shop more efficiently than ever before. Schedule work orders visually, create estimates, track work and create custom documents with a few mouse clicks. Quantum MX is online, powerful, and designed to help you operate lean and efficiently. Can you create an invoice in less than 2 minutes? Quantum MX is extremely powerful by itself, but even more powerful when combined with your accounting system. Our seamless integration with Quickbooks Online gives you the ability to generate work order invoices from within Quantum MX. Can you generate logbook entries for an annual inspection in less than five minutes? Turn your corrective action memos into logbook entries with one click. Quantum MX smartly creates beautifully formatted logbook stickers with your logo and company information. Click - Print - Sign - DONE. Can you find all Annual Inspections coming due next month in less than 20 seconds? Quantum MX notifies you when maintenance events are coming due. How many hours does this vacuum pump have? What battery P/N was last installed and when? How often are we replacing main tires? How is our inventory level trending over time? What annual inspections are coming due next month? Can you get a real time update of your parts inventory in less than 10 seconds? Switching to Quantum MX is easy, especially if you are using Quickbooks Online. Import your Customers into Quantum MX. Import your Products/Parts database into Quantum MX (including inventory). Configure Aircraft and scheduled maintenance reminders. Can your customers get an online status sheet of all recurring maintenance items? Quantum MX provides a secure online portal where you customers can view information about their aircraft. Customers update aircraft tach times. Customers view a maintenance reminder status sheet. Customer login is not required. Send automated email reminders to customers to update their aircraft status. Quantum MX is mature with world class features. Modern, web-based design that is easy to learn and use. 100% online, no mobile apps to install. Secure hosting in a world-class data center. Monthly price includes unlimited users. Import Aircraft from FAA and Canadian Transport Registration databases. Dynamic Checklists help conform and document detailed procedures. Airline MROs have complex online management systems that support the complexity of their maintenance operations. You too can benefit from modern IT solutions, but without the expense. Try Quantum MX FREE for 30 days and see how you can be more efficient in your A&P business. Use the spacebar to advance or arrows to navigate the presentation. After your free trial ends, you will be billed $79 every 30 days. Deliver more aircraft with increased productivity. Quantum MX is fast, flexible, and mobile. 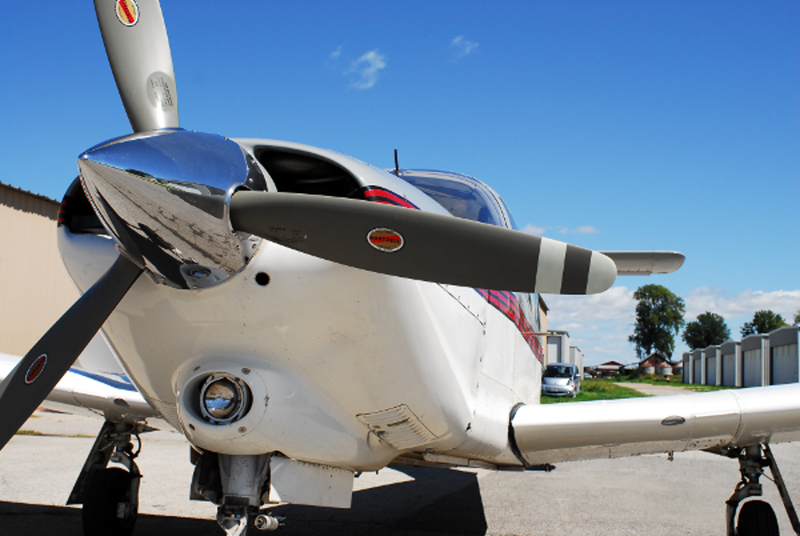 A large number of General Aviation A&P shops are owned by Inspector Authorized (IA) holders who double as small business owners and maintenance technicians. In a small A&P shop scenario, the owner is the IA chief mechanic, parts clerk, quality inspector, shop manager, accountant and primary customer interface for the business. The IA faces a time crunch challenge, having to juggle customer relations, inspections, supervision, ordering parts, delivering aircraft on time, and accounting. Quantum-MX was designed to give small shops a professional, reliable IT infrastructure, without the expense and overhead of a large scale custom solution, allowing the shop owner to organize, deliver and document more work, as efficiently as possible. Quantum-MX also includes features that help large shops operate more efficiently. In a WiFii enabled hangar, technicians may use Quantum MX on tablet computers, cell phones, or a shop floor computer to document work, clock in/out, look up technical manuals, and print logbook stickers. In the office, managers, parts, accounting and quality teams can monitor the work performed, parts inventory, and time sheets, efficiently from any computer or mobile device. Quantum MX supports organizations with multiple P&L, providing an isolation of work orders, inventory, and accounting settings per team. Start now and lock in $79/month pricing for life. Initially, you will become more efficient in receiving aircraft, managing work, ordering parts, generating logbook entries and invoices. Over time, your database will grow, enabling you to see trends in unscheduled maintenance, search past work history, and quickly identify and order parts. These features are packaged in a modern, secure, online package that is accessible on mobile devices. Plan work using the integrated work order calendar. Keep track of squawks for your entire fleet of aircraft. Schedule date or tach based maintenance reminders, e.g. Annuals, ADs, 100hr, 91.411/91.413. Keep a library of aircraft documentation, tech manuals, online and readily accessible. Keep track of your parts inventory, with history charts that help you optimize your inventory control. Keep track of parts orders and generate Purchase Orders in PDF or Quickbooks Online. 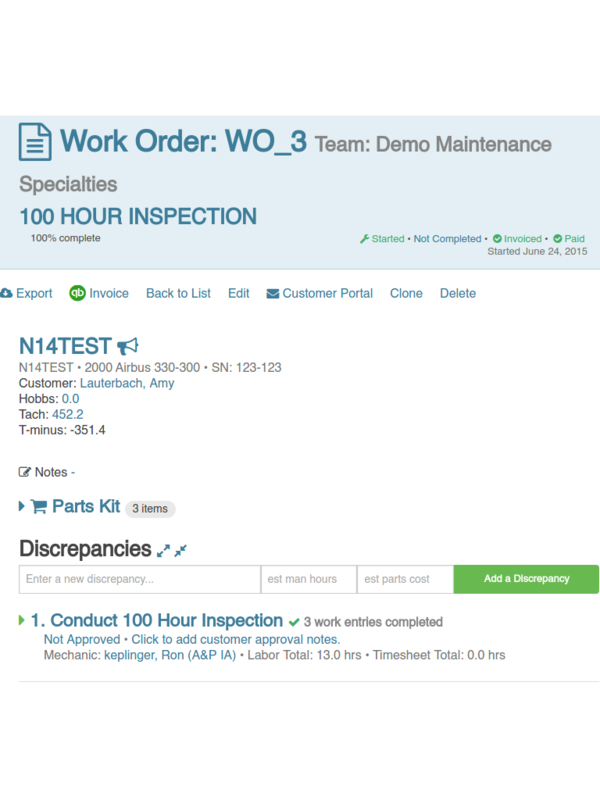 Generate work orders during the maintenance process. Build checklists for complex repair station or maintenance procedures. Track the completion of checklist items. Clock in and out to track time spent performing work. Automatically generate logbook entries based on work performed statements. Generate aircraft weight and balance updates based on work order parts installed / removed. Document Customer and Vendor call history, notes and appointments using built-in CRM features. Send company internal messages with built-in messaging features. Automatically generate Quickbooks Online invoices based on completed work orders. See a frequency analysis of unscheduled maintenance events to help you develop condition based, preventative maintenance schedules. Get customer updates of aircraft tach times using an automated email and secure customer portal. Increase customer value by giving them customer portal access to their aircraft status report. Save time by generating documentation seamlessly. Quantum MX eliminates tedious, duplicative, time wasting effort. Repair stations often perform A&P work along with their repair station work. The classic example is an avionics repair station, certified to perform avionics repairs and installs. Mechanics remove legacy equipment and wiring, install new systems, file the necessary documents and certify the airworthiness of the new installation. Quantum MX enables high efficiency in this work flow with its work order, logbook and document generating capability. Quantum MX allows you to embed tags into Open Office documents and use them as document templates. Our document generation feature is extremely powerful and allows you to create 337, 8110-3, Weight and Balance Sheets, Work Orders, Parts Manifests, Shipping Orders, and any other document in your custom format. Along with document generation, you get document attachments, so you can upload and attach documents to aircraft, work orders, and logbook entries. Create PDF Invoices, Sales Receipts, Work Order Summaries, and Packing Slips. Generate PDF Documents using your own custom form-fill templates. Document work order inspector approvals with built-in signature features. Generate PDF Logbook Entries suitable for printing on stickers with your company name and logo. Generate aircraft weight and balance sheets based on work order parts removed and installed. 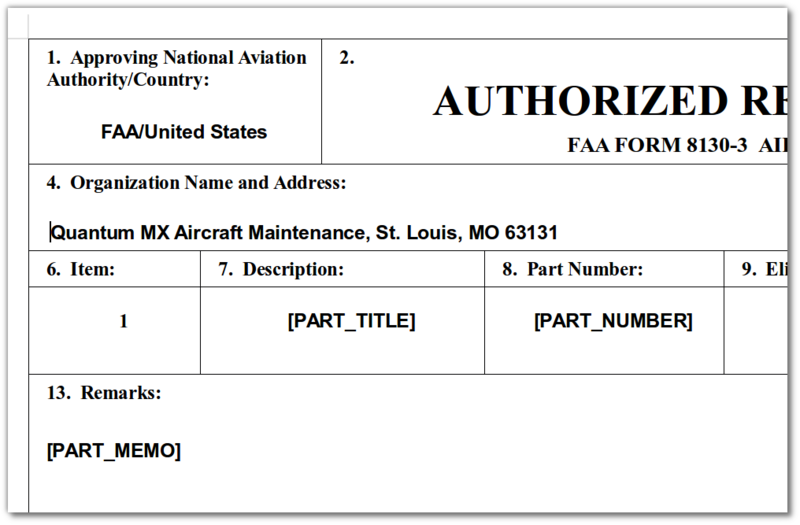 Export and print records to meet FAA requirements, while maintaining secure, searchable records online. Store signed documents online for safekeeping. Keep a library of checklists that you can combine at the work order level to document complex procedures. Checklists are live, and capture the user and date when items are checked. Aircraft owners and maintainers need to work together efficiently to maintain the safest possible aircraft. When owners and maintainers collaborate in the same Quantum MX cloud, great things can happen. Owners can leverage customer portal features to input current aircraft times and view an updated maintenance status sheet. Quantum MX reports can help identify failure patterns for alternators, vacuum pumps, and other equipment that is typically repaired on a failure condition. Technicians can help owners develop condition based preventative maintenance schedules to ensure that failures do not happen in service. Technicians can spend less time paging through paper logbooks and parts manuals, and more time repairing aircraft.